To install STOR2RRD follow all tabs from the left to the right. # yum list | egrep "httpd|rrdtool|perl|sharutils"
You might need to add stor2rrd user (lpar2rrd for Virtual Appliance) into /var/adm/cron/cron.allow under root user when crontab cmd fails. Apache 2.4.4 from M. Perlz's archive. AIX Apache 2.4.18 from IBM AIX Toolbox for Linux Applications. All supported storages with feature matrix. Brocade Network Advisor as a data source installation instructions. Installation procedure is same for Cisco, Brocade and QLogic (supported since v2.00) switches. Only in case of usage Brocade/QLogic Virtual Fabric you have to do special access configuration. Cisco VSAN support works automatically. Do not use the latest packages on AIX, it does not work, use net-snmp-5.6.2.1-1! This must work exactly as above! Launch a command line interface for the Brocade/QLogic switch and log in with Administrator credentials. The community strings will be listed. Enter the new community string and proceed. # <SNMP community string> is usually set to string "public". In this case you can leave it blank. Parameter -l 1,128 defines virtual fabrics visible for this user. Parameter -h 128 defines home virtual fabrics. Example above allows virtual fabrics 1 and 128 for user snmpuser1. test access, you should see ports configured for your specific VF (Virtual Fabric). Note a potential CPU issue on switches when you use vFabric support. 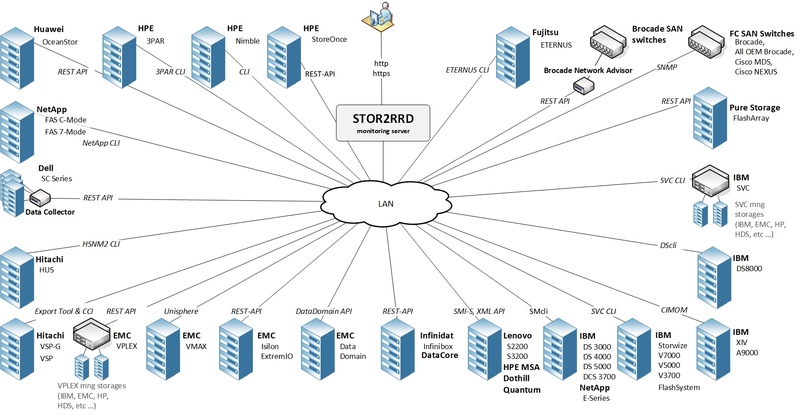 Since now use stor2rrd user only (not root). QLogic note: use this fix for STOR2RRD 2.0x to get config_check.sh working properly for QLogic. Could not load module /opt/freeware/lib/libnetsnmp.a(libnetsnmp.so.25). Dependent module /usr/lib/libcrypto.a(libcrypto.so.1.0.1) could not be loaded. Brocade Network Advisor is supported as data source for your Brocade switches since STOr2RRD v2.10.. It replaces SNMP monitoring (it might even run simultaneously with older SNMP implementation). In compare to SNMP monitoring when must be queried every SAN switch independenly. BNA acts as single data source for all data. Note that BNA v12 and older is not supported. Allow access though the network from the STOR2RRD host to the BNA on ports 443 (HTTPS). Create user stor2rrd on all your BNA's under operator_ro role. 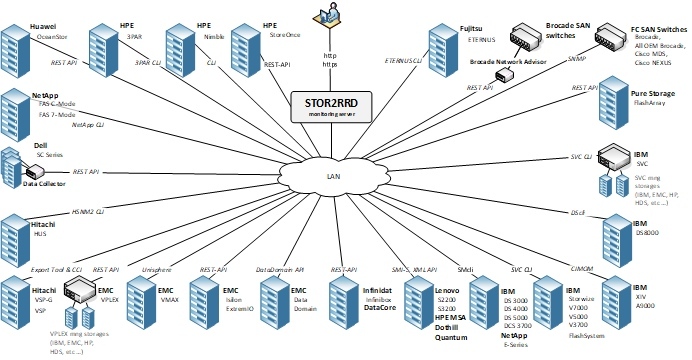 Define All Fabrics, All Hosts in Responsibility Area for user stor2rrd in BNA. Above shows 2 BNA's. Primary with IP 192.168.1.1 and backup BNA node with 192.168.1.2. Backup (stand-by) BNA node does not have to be specified. statusReason      : Switch Status is HEALTHY. Assure you use BNA 14.x+, BNA v12.x are not supported. Assure you use STOR2RRD version 2.20 at least. Tue Oct 31 17:08:20 2017:                LOGIN failed! Can you log on to the BNA UI as stor2rrd? Do you see all switches? CPU and memory data is not presented. Product uses SNMP v1,2, read-only access (port 161 UDP) to get data from LAN switches. Only Cisco and Huawei switches are tested so far. 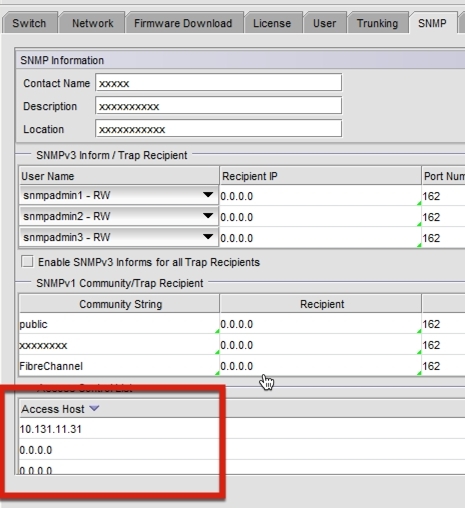 Generally all network devices having SNMP MIBs compatible with Cisco should work. # <VENDOR> can be set to "CISCO" or leave it blank for non-CISCO switches. # <GROUP> is name for group which can be used for grouping multiple switches in UI menu (you can leave it blank). You can run below script to discover automatically LAN switches. Note that even not LAN switches could be listed, review the output! In case given range contains VSS (Virtual Switching System) both of virtualized switches might be detected. Add only one of these rows in lan-list.cfg. 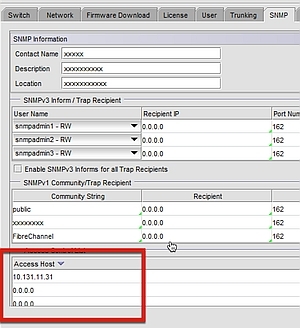 SNMP port    : not defined! Used SNMP default port "161"! If you run above script without any parameter then it checks all configured switches. Any further ideas or thoughts are welcome! Scalar found where operator expected at ./bin/lanperf.pl line 366, near "'0' $data_out"